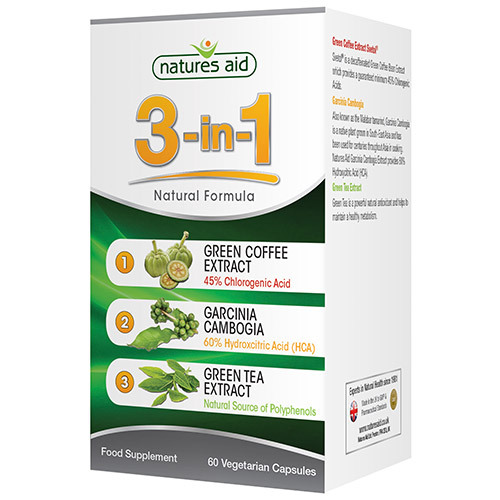 Natures Aid 3-in-1 natural formula combines all three key ingredients into one convenient supplement. Svetol is a decaffeinated Green Coffee Bean Extract which provides a guaranteed minimum 45% Chlorogenic Acids. Also known as the Malabar tamarind, Garcinia Cambogia is a native plant grown in South-East Asia and has been used for centuries throughout Asia in cooking. Natures Aid Garcinia Cambogia Extract provides 60% Hydroxycitric Acid (HCA). Garcinia Cambogia Extract, Green Coffee Bean Extract Prep, (Green Coffee Bean Extract, Maltodextrin, Silicon Dioxide), Green Tea Extract, Cellulose, Microcrystalline Cellulose. Below are reviews of Natures Aid 3-in-1 Natural Formula - 60 Vegicaps by bodykind customers. If you have tried this product we'd love to hear what you think so please leave a review.